Ventura Grain owner George Lewis carries a bag of hog feed for an order. Many of George Lewis’s fellow millennials are in desk jobs of one kind or another. But Lewis, 28, a former private wealth adviser, ditched his cubicle for an unconventional agricultural pursuit — to run Ventura Grain, an almost century-old grain mill that supplies animal feed. 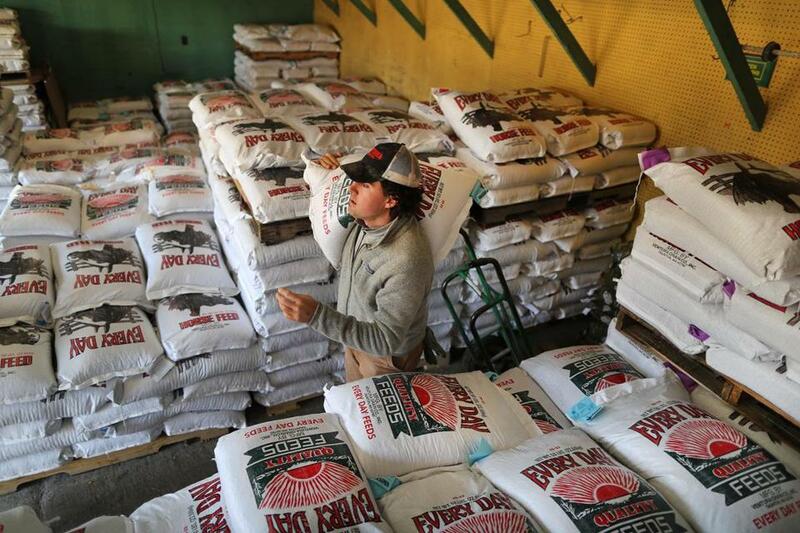 The Taunton-based outfit is one of the last independent grain companies in the Northeast. Its owners last year put the family-run business up for sale — the seven acres of fields, the grain elevator, bins, and retail store — hoping that the agricultural heritage of the longtime operation would be preserved. In the meantime, Lewis, who had earned an MBA and had a degree in earth science and sustainability in addition to an economics background, had decided that he wanted to go back to the land. Being a traditional farmer seemed financially risky, so when he heard about Ventura Grain, Lewis felt it was his opportunity to help revive the operation and leave a legacy. “I’d be lying if I didn’t admit that the learning curve was a little steep. I’d never run a mill before,” says Lewis, who purchased the production facility and then worked with the three Ventura brothers to continue to manufacture their own brand of feed for livestock and small animals — including cows, emus, guinea pigs, llamas, chickens, quail, sheep, goats, and rabbits. “Most people think all we do is push a button and the feed is ready,” said Lewis. “But a lot more goes into making a pellet than people realize, from ingredient sourcing, storage, processing, handling, weighing, mixing, bagging – the list goes on and on.” The Globe spoke with Lewis about forging a new career in livestock agriculture. “A grain mill in Taunton might sound like an oxymoron of sorts, but depending on who you talk to, there used to be upwards of 15 feed mills here at one point. Taunton was a major shipping location for grains coming from all over New England. “At the back side of our mill is a railroad track, allowing us to receive raw ingredients in rail cars. The tracks end at our property, so we have the luxury of taking three days to unload roughly 100 tons of grain. When the railcar hatch is opened, the grain is pulled in by a drag conveyer, which empties into an elevator that goes up to the top of the silo. We have 23 other bins with a storage capacity of roughly 1.5 million pounds of raw ingredients. “Our ingredients are sourced from all over: corn from Canada, soybean meal from Indiana, wheat from the Midwest, distiller’s grain from New York. We make feed for bulk delivery to farms, or bagged feed to sell in our store to dealers. “Without the highest-quality feed, animals will not thrive. Many require a strict ration of vitamins, minerals, and proteins during their life cycle. Turkeys, for example, will go through seven or eight different feed formulations in just a few months. “I grew up on a gentleman’s hobby farm and always loved raising crops and animals. It’s satisfying to use that background to understand the various husbandry issues that farmers may be dealing with. And my financial background allows me to strategically purchase commodity grains, to reduce prices and keep costs lower. “There is a melange of skills needed to run this operation — financial literacy, tree trimming, mill work, snow plowing, repair work, customer acquisition, inventory management. A typical day starts around 6 a.m. when I arrive at the mill and start up some of the equipment — boiler, air compressors, computers, etc. The mill has literally thousands of moving parts, with much of the major machinery from the ’70s and ’80s. Every day, things break and need to be maintained. But it’s so empowering to work with my hands and visibly see results. Cindy Atoji Keene can be reached at cindy@cindyatoji.